This entry was posted on October 18, 2016 at 4:17 pm and is filed under Biographical, Education, The Universe and Stuff with tags Andrew Liddle, Astronomy Centre, Carlos Frenk, John Gribbin, Martin Rees, University of Sussex. You can follow any responses to this entry through the RSS 2.0 feed. You can leave a response, or trackback from your own site. Congratulations to Sussex. I wish had been able to take the time off to attend. I have very fond memories of the time I spent there. Many of us are in far flung places, but I try to keep up with folks as best I can. When I was in Texas I was able to catch up with Jaime Stein-Schabes (who was working in industry) and Richard Fitzpatrick (at UT Austin). Jim Skea is in Brazil and I had hoped to catch up with him down there a couple of years ago down but timing didn’t work out, but I’ll have another chance next year I hope. Small world. Came across Leon Mestel’s name via a completely different path, the 1970s/80s chess exploits of his son, the mathematician (and chess Grandmaster) Jonathan (AJ) Mestel. Penrose also comes from a chess-playing family. At the time I was in Sussex, Leon Mestel was mainly working on the pulsar magnetosphere – a fearsome problem in relativistic plasma theory. Here is a talk by Nauenberger about it. I don’t know anything about that! Incidentally, Donald Lynden-Bell’s paper from 1966 basically generalises Chandrasekhar’s calculation to include rotation. Angular momentum changes the criterion for collapse somewhat. Werner Israel mentions Stoner, Anderson, and so on in his article in the famous 300 Years of Gravitation. I think that this is well known, among historians of science if not among scientists. Sorry if this comment comes out twice. Philip: I think the calculation was done before Chandra embarked on his train journey. Also I think the main calculation was done by Stoner and Chandra substituted the mean molecular weight. Also in his Nobel prize lecture, Stoner’s work is not cited. Yes, Stoner did a somewhat coarser version before Chandra. Chandra cites him. Where’s the problem? My personal view is that recording the history of mid- and late-twentieth century astronomical research groups is very important, particularly while many of the participants are still with us. It’s a little concerning that we do not see more attention to doing this. 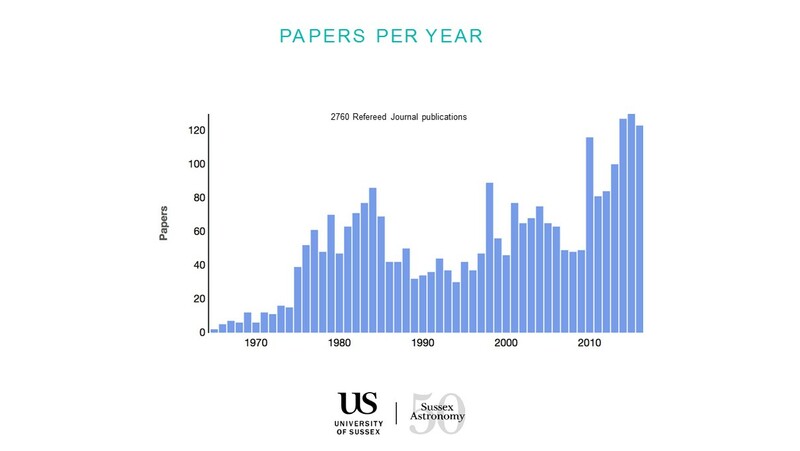 It’s nice to see this event at the University of Sussex making some attempt at collating material about the Astronomy Centre’s recent history. I hope print outs of presentations and other material will have been deposited in the university archives.